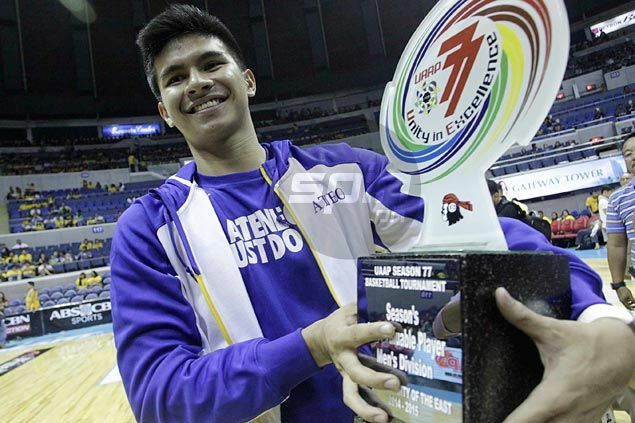 THE biggest individual award represents a small consolation for Kiefer Ravena. As he finally received the trophy on Wednesday, the Ateneo star reiterated he would take a championship crown over the MVP award - anytime. “Most definitely, I’ll trade the MVP for a championship. Who doesn’t want to play in the finals? Siguro kulang pa talaga,” he added. The UAAP trophy presentation came weeks after Ravena was confirmed top player in the regular season, and a week since the Eagles were toppled from the top spot of the Final Four by No. 4 seed National University. Nevertheless, Ravena said the MVP is still a blessing to Ateneo’s campaign in Season 77 that saw him score a career-high 38 points in one game. Ravena was the hands down winner of the MVP plum after topping the statistics-based race at the end of Season 77. Aside from the MVP award, Ravena also won most of the minor awards given out by sponsors along with a spot in the Mythical Five given by the league. Ravena vowed the Blue Eagles will be better than this season as he tries to go for another championship before he ends his collegiate career. “We will be stronger than next season. We have time to have our rookies get more experience and be better prepared,” said Ravena.